Lots occurred over the next two and a half months, including a curious incident in which some of the hungry, blockaded Indians attempted to slaughter a cow. Reporters and photographers gathered to watch. Nothing happened. None of the Indians—some urban activists, some from Sioux reservations—actually knew how to butcher cattle. Fortunately, a few of the journalists did know, and they took over, ensuring dinner for the starving rebels. That was a much discussed event during and after Wounded Knee. The most common reading of this was that basically we were fakes. Indians clueless about butchering livestock were not really Indians. It presents the unavoidable question: Are Indian people allowed to change? Are we allowed to invent completely new ways of being Indian that have no connection to previous ways we have lived? Authenticity for Indians is a brutal measuring device that says we are only Indian as long as we are authentic. Part of the measurement is about percentage of Indian blood. The more, the better. Fluency in one’s Indian language is always a high card. Spiritual practices, living in one’s ancestral homeland, attending powwows, all are necessary to ace the authenticity test. Yet many of us believe taking the authenticity tests is like drinking the colonizer’s Kool-Aid—a practice designed to strengthen our commitment to our own internally warped minds. In this way, we become our own prison guards. And while there may be other issues with Warren’s recipe, it’s revealing that we often act as if the Cherokee Nation somehow ceased to evolve—or cook for itself—after the introduction of mayonnaise. Generally speaking, smart white people realize early on, probably even as children, that the whole Indian thing is an exhausting, dangerous, and complicated snake pit of lies. And…the really smart ones somehow intuit that these lies are mysteriously and profoundly linked to the basic construction of the reality of daily life, now and into the foreseeable future. And without it ever quite being a conscious thought, these intelligent white people come to understand that there is no percentage, none, in considering the Indian question, and so the acceptable result is to, at least subconsciously, acknowledge that everything they are likely to learn about Indians in school, from books and movies and television programs, from dialogue with Indians, from Indian art and stories, from museum exhibits about Indians, is probably going to be crap, so they should be avoided. This leads him to an unforgettable conclusion: “Generally speaking, white people who are interested in Indians are not very bright.” But that’s only because most of the others are prudent enough to stay well away—and even Warren, who is undeniably smart, doesn’t seem to have realized that this was a fight that she couldn’t possibly win. One white person who seems unquestionably interested in Indians, in his own way, is Donald Trump. True to form, he may not be very bright, but he also displays what Newt Gingrich calls a “sixth sense,” in this case for finding a formidable opponent’s Achilles heel and hammering at it relentlessly. Elizabeth Warren is one of the most interesting people to consider a presidential run in a long time, but Trump may have already hamstrung her candidacy by zeroing in on what might look like a trivial vulnerability. And the really important point here is that if Warren’s claims about her Native American heritage turn out to be her downfall, it’s because the rest of us have never come to terms with our guilt. The whole subject is so unsettling that we’ve collectively just agreed not to talk about it, and Warren made the unforgivable mistake, a long time ago, of folding it into her biography. If she’s being punished for it now, it’s because it precipitates something that was invisibly there all along, and this may only be the beginning. Along the way, we’re going to run up against a lot of unexamined assumptions, like Milbank’s amusement at that canned crab. (As Smith reminds us: “Indians are okay, as long as they meet non-Indian expectations about Indian religious and political beliefs. And what it really comes down to is that Indians are okay as long as we don’t change too much. Yes, we can fly planes and listen to hip-hop, but we must do these things in moderation and always in a true Indian way.” And mayonnaise is definitely out.) Depending on your point of view, this issue is either irrelevant or the most important problem imaginable, and like so much else these days, it may take a moronic quip from Trump—call it the Access Hollywood principle—to catalyze a debate that more reasonable minds have postponed. In his discussion of Wounded Knee, Smith concludes: “Yes, the news media always want the most dramatic story. But I would argue there is an overlay with Indian stories that makes it especially difficult.” And we might be about to find out how difficult it really is. [The professor] then led me to the frame, about the sides, whereof all his pupils stood in ranks. It was twenty feet square, placed in the middle of the room. The superfices was composed of several bits of wood, about the bigness of a die, but some larger than others. They were all linked together by slender wires. These bits of wood were covered, on every square, with paper pasted on them; and on these papers were written all the words of their language, in their several moods, tenses, and declensions; but without any order…The pupils, at his command, took each of them hold of an iron handle, whereof there were forty fixed round the edges of the frame; and giving them a sudden turn, the whole disposition of the words was entirely changed. He then commanded six-and-thirty of the lads, to read the several lines softly, as they appeared upon the frame; and where they found three or four words together that might make part of a sentence, they dictated to the four remaining boys, who were scribes. What if, instead, you fed it a few dozen notions taken from the works of [occult writers]—for example, the Templars fled to Scotland, or the Corpus Hermeticum arrived in Florence in 1460—and threw in a few connective phrases like “It’s obvious that” and “This proves that?” We might end up with something revelatory. Then we fill in the gaps, call the repetitions prophecies, and—voila—a hitherto unpublished chapter of the history of magic, at the very least! When I first read this as a teenager, I thought it was one of the great things in the world, and part of me still does. I immediately began to look for similar connections between random ideas, which led me to some of my best story ideas, and I still incorporate aspects of randomness into just about everything that I do. Yet there’s also a pathological element to this form of play that I haven’t always acknowledged. What makes it dangerous, as Eco understood, is the inclusion of such seemingly innocent expressions as “it’s obvious that” and “this proves that,” which instantly transforms a scenario into an argument. (On the back cover of the paperback edition of Foucault’s Pendulum, the promotional copy describes Abulafia as “an incredible computer capable of inventing connections between all their entires,” which is both a great example of hyping a difficult book and a reflection of how credulous we can be when it comes to such practices in real life.) We may not be able to rule out any particular combination of events, but not every explanatory system is equally valid, even if all it takes is a modicum of ingenuity to turn it into something convincing. I used to see the creation of conspiracy theories as a diverting game, or as a commentary on how we interpret the world around us, and I devoted an entire novel to exorcising my fascination with this idea. More recently, I’ve realized that this attitude was founded on the assumption that it was still possible to come to some kind of cultural consensus about the truth. In the era of InfoWars, Pizzagate, and QAnon, it no longer seems harmless. Not all patterns are real, and many of the horrors of the last century were perpetuated by conspiracy theorists who arbitrarily seized on one arrangement of the facts—and then acted on it accordingly. Reality itself can seem randomly generated, but our thoughts and actions don’t need to be. Many of the senior officials in [Trump’s] own administration are working diligently from within to frustrate parts of his agenda and his worst inclinations. I would know. I am one of them…It may be cold comfort in this chaotic era, but Americans should know that there are adults in the room. We fully recognize what is happening. And we are trying to do what’s right even when Donald Trump won’t. The result, he claims, is “a two-track presidency,” with a group of principled advisors doing their best to counteract Trump’s admiration for autocrats and contempt for international relations: “This isn’t the work of the so-called deep state. It’s the work of the steady state.” He even reveals that there was early discussion among cabinet members of using the Twenty-Fifth Amendment to remove Trump from office, although it was scuttled by concern of precipitating a crisis somehow worse than the one in which we’ve found ourselves. Like most anonymous quotes and tracts, this one is a PR stunt. Mr. Senior Administration Official gets to use the distributive power of the New York Times to recast an entire class of federal appointees. No longer are they enablers of a foolish and capricious president. They are now the country’s most precious and valued patriots. In an appearance on Wednesday afternoon, the president pronounced it all a “gutless” exercise. No argument here. But Wemple’s offhand reference to “the distributive power” of the Times makes me think that the real motive is staring us right in the face. It’s a form of Authentication by Newspaper. Let’s say that you’re a senior official in the Trump administration who knows that time is running out. You’re afraid to openly defy the president, but you also want to benefit—or at least to survive—after the ship goes down. In the aftermath, everyone will be scrambling to position themselves for some kind of future career, even though the events of the last few years have left most of them irrevocably tainted. By the time it falls apart, it will be too late to claim that you were gravely concerned. But the solution is a stroke of genius. You plant an anonymous piece in the Times, like the founders of Surety publishing its hash value in the classified ads, except that your platform is vastly more prominent. And you place it there precisely so that you can point to it in the future. After Trump is no longer a threat, you can reveal yourself, with full corroboration from the paper of record, to show that you had the best interests of the country in mind all along. You were one of the good ones. The datestamp is right there. That’s your endgame, no matter how much pain it causes in the meantime. It’s brilliant. But it may not work. As nearly everyone has realized by now, the fact that a “steady state” of conservatives is working to minimize the damage of a Trump presidency to achieve “effective deregulation, historic tax reform, a more robust military and more” is a scandal in itself. This isn’t proof of life. It’s the opposite. At the center is a grim cloister, a walkway with eight hundred weathered steel columns, all hanging from a roof. Etched on each column is the name of an American county and the people who were lynched there, most listed by name, many simply as “unknown.” The columns meet you first at eye level, like the headstones that lynching victims were rarely given. But as you walk, the floor steadily descends; by the end, the columns are all dangling above, leaving you in the position of the callous spectators in old photographs of public lynchings. Of course, if the memorial had been more costly, it might not exist at all, and certainly not with the level of independence and the clear point of view that it expresses. Yet if there’s one striking thing about the coverage of the project, it’s the absence of the name of any one architect or designer. Neither of these two words even appears in the Times article, and in the Post, we only read that the memorial was “designed by [Equal Justice Initiative founder Bryan] Stevenson and his colleagues at EJI in collaboration with the Boston-based MASS Design Group.” When you go to the latter’s official website, twelve people are credited as members of the project design team. This is markedly different from the way in which we tend to talk about monuments, museums, and other architectural works that are meant to invite our attention. In many cases, the architect’s identity is a selling point in itself, as it invariably is with Frank Gehry, whose involvement in a project like the Guggenheim Museum Bilbao is consciously intended to rejuvenate an entire city. In Montgomery, by contrast, the designer is essentially anonymous, or part of a collaboration, which seems like an aesthetic choice as conscious as the design of the space itself. The individual personality of the architect departs, leaving the names and events to testify on their own behalf. Which is exactly as it should be. If anything, the subject matter of the National Memorial for Peace and Justice is even more fraught, and the decision to place the designers in the background seems partially intended to focus the conversation on the museum itself, and not on those who made it. In partially delegating the production of form to the computer, the antibox has seemingly boosted the production of extravagant shapes beyond any apparent limits. What started as a deliberate meditation on the notion of form in the early antibodies has turned into a game of chance. Authorship has become relative: with creation now delegated to algorithms, the antibox’s main delight is the surprise it causes to the designers. Its opposite number is the National Memorial for Peace and Justice, which was built with simple materials and techniques that rely for their impact entirely on the insight, empathy, and ingenuity of the designer, who then quietly fades away. The architect can afford to disappear, because the work speaks for those who are unable to speak for themselves. And that might be the most powerful message of all. There is a fancy word for “going beyond your province”: “ultracrepidate.” So much of copy editing is about not going beyond your province. Anti-ultracrepidationism. Writers might think we’re applying rules and sticking it to their prose in order to make it fit some standard, but just as often we’re backing off, making exceptions, or at least trying to find a balance between doing too much and doing too little. A lot of the decisions you have to make as a copy editor are subjective. For instance, an issue that comes up all the time, whether to use “that” or “which,” depends on what the writer means. It’s interpretive, not mechanical—though the answer often boils down to an implicit understanding of commas. In order to be truly objective, in other words, you have to be a little subjective. Which equally true of writing as a whole. McPhee continues: “Book publishers prefer to regard fact-checking as the responsibility of authors, which, contractually, comes down to a simple matter of who doesn’t pay for what. If material that has appeared in a fact-checked magazine reappears in a book, the author is not the only beneficiary of the checker’s work. The book publisher has won a free ticket to factual respectability.” And its absence from the publishing process feels like an odd evolutionary vestige of the book industry that ought to be fixed. It’s not surprising that one of the persistent jokes from the Trump era is the suggestion that we’re living in a bad piece of fiction…Pretending we’re all minor characters in a work of fiction can be a way of distancing ourselves from the seeming horror of our time or emphasizing our own feelings of powerlessness, and pointing to “the writers” often helps us deny any responsibility we may have for Trump, whether as voters or as journalists who covered the election. But whatever else we’re doing when we joke about Trump and the swirl of chaos around him as fiction, we’re expressing a wish that this moment will resolve in a narratively and morally comprehensible fashion. Perhaps we’re also hoping that reality itself will have a fact checker after all, and that the result will make a difference. We don’t know if it will yet. But I’m hopeful that we’ll survive the exponential explosion of errata. 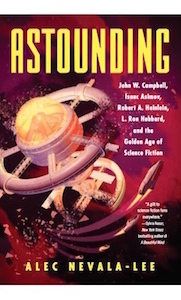 Note: With less than half a year to go until the publication of Astounding: John W. Campbell, Isaac Asimov, Robert A. Heinlein, L. Ron Hubbard, and the Golden Age of Science Fiction, I’m returning, after a long hiatus, to the series in which I highlight works of science fiction that deserve to be rediscovered, reappraised, or simply enjoyed by a wider audience. You can read the earlier installments here. Wakanda, like many places in Africa, is home to a great wealth of natural resources. But unlike most places in Africa, it was able to avoid European colonization. Shielded by the powers of vibranium, the element mined beneath its surface that enabled the country to develop the world’s most advanced technology, Wakanda resisted invaders while its rulers constructed a beautiful space-age kingdom. Or as the writer Evan Narcisse observed elsewhere to the Post: “Wakanda represents this unbroken chain of achievement of black excellence that never got interrupted by colonialism.” It’s imaginary, yes, but that’s part of the point. In his review, Anthony Lane of The New Yorker delivered a gentle rebuke: “I wonder what weight of political responsibility can, or should, be laid upon anything that is accompanied by buttered popcorn. Vibranium is no more real than the philosopher’s stone…Are 3-D spectacles any more reliable than rose-tinted ones, when we seek to imagine an ideal society?” But the gap between dreams and reality is precisely how the best science fiction—and Black Panther, along with so much else, is a kickass science fiction movie—compels us to see the world with new eyes. The distrust of the European and the white man as a whole was prevalent, especially here in Africa. However, and particularly in Africa, the citizens of the new countries were almost unbelievably uneducated, untrained, incapable of engineering their own destiny…We of the Reunited Nations teams are here because we are Africans racially but not nationally, we have no affiliations with clan, tribe, or African nation. We are free to work for Africa’s progress without prejudice. Our job is to remove obstacles wherever we find them. To break up log jams. To eliminate prejudices against the steps that must be taken if Africa is to run down the path of progress, rather than to crawl. Monarchies are of the past, and El Hassan is the voice of the future, something new. We won’t admit he’s just a latter-day tyrant, an opportunist seizing power because it’s there crying to be seized. Actually, El Hassan is in the tradition of Genghis Khan, Temerlane, or, more recently, Napoleon. But he’s a modern version, and we’re not going to hang the old labels on him. A Planner thinks he already knows the answers; he thinks of poverty as a technical engineering problem that his answers will solve. A Searcher admits he doesn’t know the answers in advance…A Planner believes outsiders know enough to impose solutions. A Searcher believes only insiders have enough knowledge to find solutions, and that most solutions must be homegrown. Planners still exist in foreign aid—but they can also edit magazines. Campbell was one of them. Black Man’s Burden was his idea of how to deal with race in Analog, even as he failed to make any effort to look for black writers who knew about the subject firsthand. And it worked about as well here as it did anywhere else.